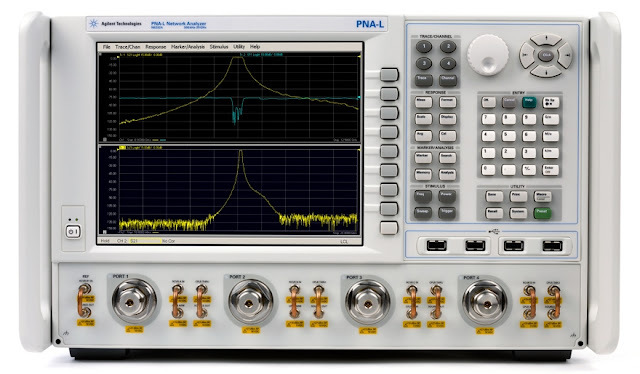 Agilent Technologies Inc. (NYSE: A) has introduced five new PNA-L vector network analyzer models, offering design and manufacturing engineers the highest performance (up to 50 GHz) in a mid-range VNA, along with lower cost and future-proof capabilities. Agilent's new N523xA PNA-L vector network analyzers replace existing N5230C models. They are available in five frequency models. Three frequency models start at 300 kHz, with two or four ports available for the 13.5- and 20-GHz models, and two ports available for the 8.5-GHz product. The other two frequency models, with two ports, start at 10 MHz and include the 43.5- and 50-GHz products. The models feature both increased measurement range (5 dB more output power and 20 dB more dynamic range) and speed (the result of a new synthesizer with faster frequency switching). They also offer an improved user interface with a 24 percent bigger display. Because the models are 100 percent compatible with the N5230C PNA-L, no changes to the user's current test setup are required. The new PNA-L models use the Agilent PNA-X's innovative components, including the CPU and display. Sharing a common hardware platform allows the PNA-L to realize continuous performance improvements as the PNA-X hardware improves. Moreover, PNA-L models can run applications previously only offered on the PNA-X platform, such as gain compression and fast continuous wave mode. Providing a lower price alternative to the Agilent PNA and PNA-X network analyzers, the new PNA-L models are well suited for a range of applications, including S-parameters of passive components and simple active device measurements of amplifier and frequency converters. They can also be used in material measurements and for signal-integrity analysis. The Agilent PNA-L is part of the PNA family of network analyzers. The PNA family includes the PNA-L, PNA and PNA-X Series, covering frequencies from 300 kHz to 1.05 THz. The PNA-L is designed for general-purpose network analysis; the PNA is the world's highest performing vector network analyzer; and the PNA-X provides complete linear and nonlinear component characterization in a single instrument with a single connection. The PNA family offers advanced connectivity via LAN, USB and GPIB; an easy-to-use open architecture based on the Microsoft Windows(r) operating system; and an extensive embedded help system. The PNA family's CPU and operating system can be upgraded as technologies evolve.